The Stick, Rip, and Stack Drill is the number one drill coverage players will use in the Speed Zone. The point of this drill is to avoid any contact by front wall blockers. When dealing with blockers in the front wall the coverage team wants to maintain as much speed as possible. If the coverage man hits the blocker he loses his speed and momentum, which are his two advantages. Instead the coverage man will look to juke the blocker (Stick), rip to avoid any contact (Rip) and then get back to his lane (Stack). The first step in teaching this technique is to execute it against a stationary defender. This is a great drill to start practice, since it is done at 75% speed it gets the players’ bodies warmed up while still working on technique for the skill. For this drill the players will be on the sideline at the intersection of a 5 yard line and the out of bonds line. The stationary player stand on the yard line, halfway between the out of bounds line and the hash. Before the drill is executed the Coach will tell the players which way they will be avoiding the blocks. On the coaches whistle the coverage player will run directly down the line at the stationary player. As he approaches he will take a jab step with the foot opposite of the direction he will avoid. The goal of this step is to convince the blocker his is trying to beat him to that side and force the blocker to turn their hips in that direction. He will then step hard towards the side he is avoiding to while clubbing the defender’s shoulder with his avoiding arm and ripping through with the opposite arm. Once the coverage man clears the blocker he gets back on the original line as quickly as possible to simulate getting back in his lane. The drill finishes when the coverage player reaches the hash. 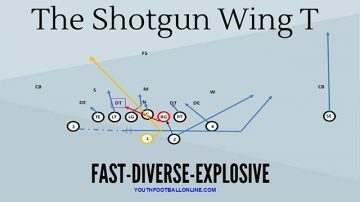 Once everyone has completed the drill going from the sideline to the hash they turn around and do the drill coming back. There are a couple of key things that coaches should be looking for in this drill. On the stick step it’s important that the coverage man sells the move with his head and body. In order to get the blocker to step in the opposite direction, the coverage man must make him believe he is planning on beating the blocker to that side. A great coaching cue is to tell the player to imagine they are crossing them over in basketball. As weird as it sounds it is the perfect way to describe a really complex movement. The second major coaching points come on the Rip section of the drill. For this section the players must focus on getting through the back of the blocker, this is the reason the stick step is so important. When the player uses his stick step to open the blocker’s hips opposite of where he wants to go, he needs to use his full upper body to get clear of the blocker. When the defender takes a stick step he must also get the arm opposite of the stick step ready to club the defender in the back. This helps push the blocker opposite of the defender and ensures that the blocker can’t get his hips around. The second stage of the rip drill is for the defender to rip through the back with the arm closest to the defender. This should be done in a low to high motion like he is throwing an uppercut punch. If the stick step was effective and the blocker has his hips turned, the rip doesn’t need to go very low. By going low the coverage man loses speed. If he has already beaten the blocker he should look to punch through the lower back of the blocker while staying tight to the man so he can’t get an angle to cut him off. If the blocker doesn’t fall for the stick step and keeps his hips towards the coverage man the rip needs to be much lower. This is done to decrease the surface area that the blocker can get a hold of. The phrase we use is that we want the blocker to have to block hard plastic (top of the shoulder pad and helmet) instead of soft plastic (chest protector). In this case the coverage player must drop his shoulder down as he is ripping through and accelerate to break any contact. The final stage of the Stick, Rip and Stack Drill is to stack the blocker behind the coverage man. This is a phrase Wide Receivers use quite often when they are running routes. For a receiver the idea is to get past the man and then get between the defender and where the ball is being thrown. The concept is that if the defender wants to make a play he has to go through the blocker. The same idea applies to coverage men but in a different context. In this context, the coverage man is looking to put himself between the blocker and the return man. If he can do this successfully the blocker can only block him from behind, which will be a penalty that almost always results in the return team starting the drive inside of their own 20. To practice this in the drill the coverage man will work to get back on his line as soon as possible. In the game it’s important that he gets back to his original landmark and then gets his eyes on the coverage men to his left and right so they can keep their relationship as they converge on the return man.